To make the best use of Viraltag's time saving and automation capabilities, you will want to set up your Posting Schedule. Your Posting Schedule is specific time slots for each social network that dictate when content added to your queue will be posted. Keep in mind : If you have made changes to the Posting Schedule, content that you have already scheduled will not reflect the change. The new time slots you set only get applied to the posts you schedule after changing the Posting Schedule. You can view the video demo or refer to the detailed explanation below. Before we get into how to schedule using the Posting schedule, let's set up your Posting Schedule. 1. Under the 'Home' section, click on the "Posting Schedule" option. 2. You will see a screen with time slots set for each day of the week and each social network. These are the pre-set time slots according to which your posts will be scheduled, you are free to edit them or add new time slots. 3. To edit existing time slots, click on that particular time slot and select a time (Hour and minutes) and assign a category. 4. To add a new time slot, click on the 'Add time slot' button and follow the same steps as mentioned in step 3. 5. 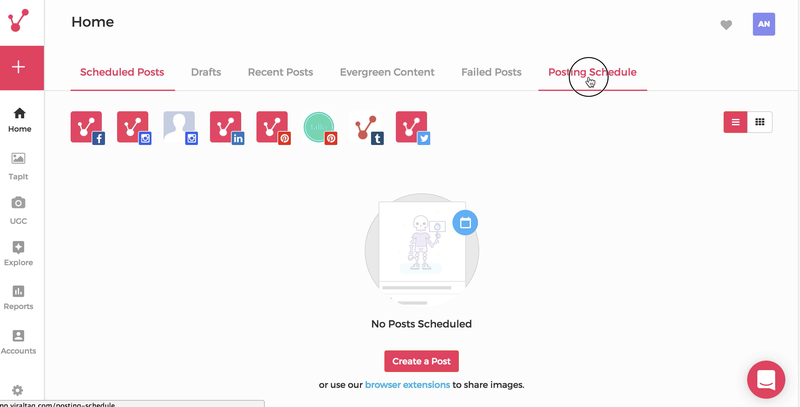 Create a customized Posting Schedule for each social network according to when you want specific posts to go out, by toggling over to each social profile icon. For Eg. Quotes in the morning at 9:00 am and Promotional Content at 5:30 pm in the evening. 6. If you wish to delete a time slot, just hover your cursor over the time slot you wish to delete, and click on the 'Dustbin' icon to remove it from the schedule. 7. 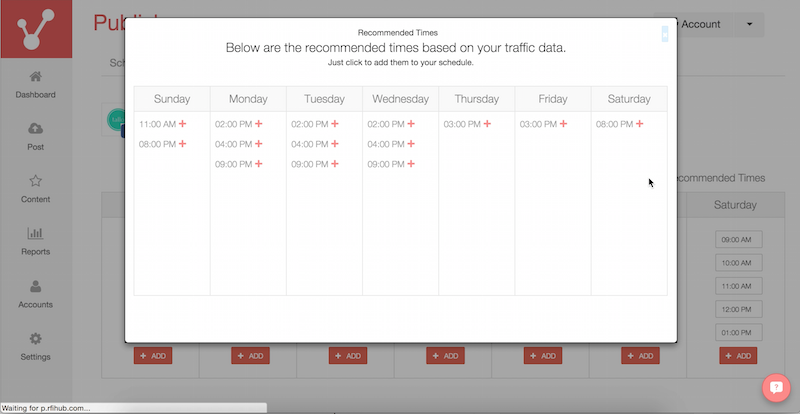 You can also set time slots through Recommended Times. This shows you the best times to post based on your traffic data. Click on the "Recommended Times" option on the top left hand corner just above the Posting Schedule table. 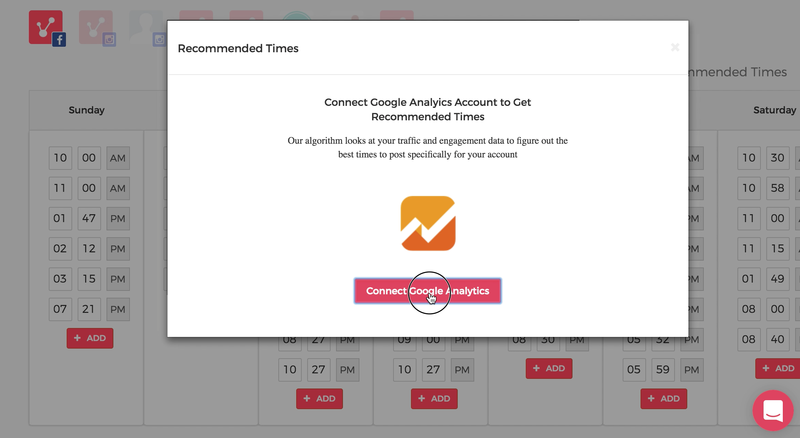 Click on 'Connect Google Analytics' to enable this feature. To add these times to your posting schedule, click on the red "+" sign next to the displayed times. Set up your time slots for each day of the week and your posts will get scheduled according to the time that has been set here. Now that we've set the time slots, you can start scheduling posts for your queue. Please note, if you have scheduled a few posts through the Posting Schedule and you want to schedule a few more posts, the next time slot that would get allotted would be after the last time slot of the previous Posting Schedule batch. If you have deleted the last few posts from the first batch, the time slot allotted would still be after the last time slot of the original posts (before they were deleted). 1. Upload your desired image/s and go to the scheduling screen. If you have uploaded only one image and wish to add this to the posting schedule, you will see the the "Add to Queue" option at the bottom of the scheduling window. Click on this and your post will get scheduled to the next time slot. 2. Your posts will be scheduled according to the pre-set time slots. You can see this under Scheduled Posts under the 'Home' section. If you select multiple Pinterest boards for example, you will create two posts, which will go out at the two next available time slots on your Posting Schedule.